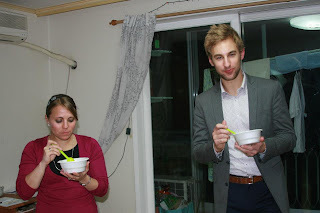 Although Koreans don't observe Thanksgiving, we made the best of it by celebrating with our friends here in the Danggam Jugong Apartment Complex. 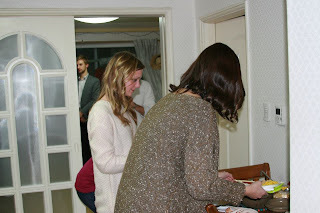 We organized a potluck and enjoyed an evening filled with delicious food, hilarious conversation, and good company. Before we dug into the smorgasbord shown above, we enjoyed a delicious squash soup as an appetizer. 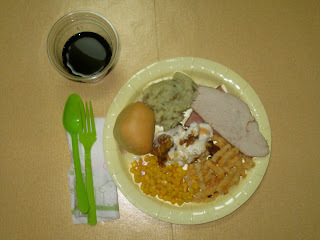 After that, we dished up our plates with turkey, ham, mashed potatoes, candied yams, corn, macaroni salad, and bread. Below is a picture of Tyler waiting patiently for his turn. I have to say, we all did a mighty fine job with the food given the states of our kitchens. 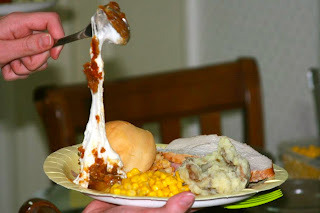 With portable stovetops and ovens the size of shoeboxes, our Thanksgiving meal turned out quite tasty. Of course, what Thanksgiving is complete without pumpkin pie? We all enjoyed this colossal Costco pie that was devoured rather quickly. We were so happy to have found pumpkin pie in Korea! Pincho, Kalie and Josh's teacup-sized Yorkie, kept us entertained throughout the evening. He charmed Tyler, as you can see from the pictures below. Here's Tyler pulling a Paris Hilton. We missed our family terribly this Thanksgiving, but we had an amazing night celebrating with new friends we've made here in Busan. Much love to everyone back home and we hope you all had a beautiful Thanksgiving!